Exit Crosstimbers (52B), the next exit after crossing North Loop 610. Make an immediate right after exiting Crosstimbers onto Riggs or the next street. Drive one block, and make a right on Fulton Street. 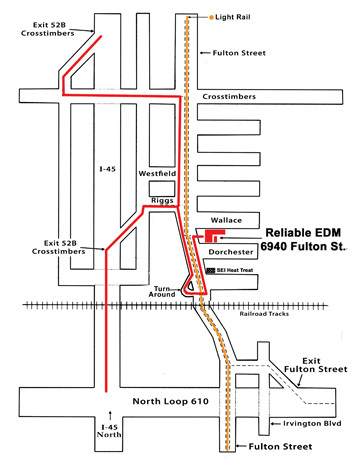 Reliable EDM is about 250 feet on your left - 6940 Fulton Street. To get to Reliable, continue on Fulton Street along the light rail line for about five blocks. A turnaround will allow one to head north on Fulton Street. Exit Crosstimbers (52B). Turn left at the light. Drive to the next light (Fulton Street), and turn right. Drive down 5 blocks, Reliable is on your left - 6940 Fulton Street. To get to Reliable, continue on Fulton Street along the light rail line for about five blocks. A turnaround will allow one to head north on Fulton Street. Exit I 45 north and follow instructions for "Heading north on I-45." Exit Fulton Street exit on North Loop 610 (exit before I 45 north). Drive north on Fulton Street about 1/2 mile. After crossing the railroad tracks, pass two streets. Reliable EDM is on your right - 6940 Fulton Street.